This kit contains three patterns, a pendulum movement, one 12" rod and bob; brass hour, minute and second hands, and instructions. Wood frame not included but described in the instructions. 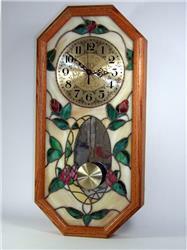 Wood frame and clock face (#8292) sold eeparately. 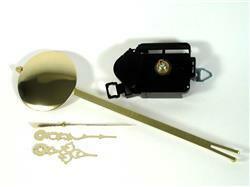 The contents of the Clarity Pendulum Clock Kit (#8290) minus the instructions. 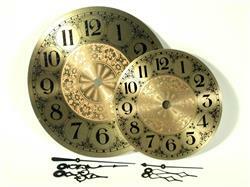 Contains: adjustable rod and bob; hour, minute and second hands; and Quartz Pendulum Movement with all assembly hardware. This kit contains 9 patterns for stained glass clocks, a solid oak pedestal, a 5" diameter brass clock face, a quartz clock movement, three clock hands, and assembly instructions. 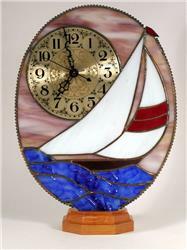 All you need to complete this project is a little stained glass and a little time! This quartz movement is extremely accurate and durable. The standard sized battery is not included.